Trade is front and center after the 2016 election, and with the ongoing talk of America first, it’s no wonder the discussion is filtering down to the beef industry. But just how much beef do we export to our neighbors to the north and south? Trade was a key campaign issue in the 2016 election. And thus far, President Trump has stayed true to keeping the issue front and center – beginning with Trump’s executive order withdrawing the U.S. from the Trans-Pacific Partnership (TPP). That said, based on campaign rhetoric from many Congressional members, Trump’s action was largely symbolic; TPP was likely dead-on-arrival anyway in Congress. Nevertheless, it’s an important development for the beef industry. Meanwhile, there is now plenty of rhetoric occurring around the U.S.-Mexico trading relationship. That, too, could prove to be an important dynamic for U.S. beef markets going forward, not to mention Trump’s broader call to reopen the NAFTA agreement. None of that is meant to be political commentary one way or the other. Rather, it simply draws attention to the political realities of what’s occurring in Washington, D.C., and the potential ramifications for the beef industry. Accordingly, this week’s graph provides some historical perspective around the value of beef exports to Canada, Mexico and the rest of the world. Beef exports, in total, equated to nearly $7 billion in 2014 while generating about $6 billion of revenue in both 2013 and 2015, respectively. Final numbers for 2016 will be available in several weeks, but through November had tracked very close to 2015. 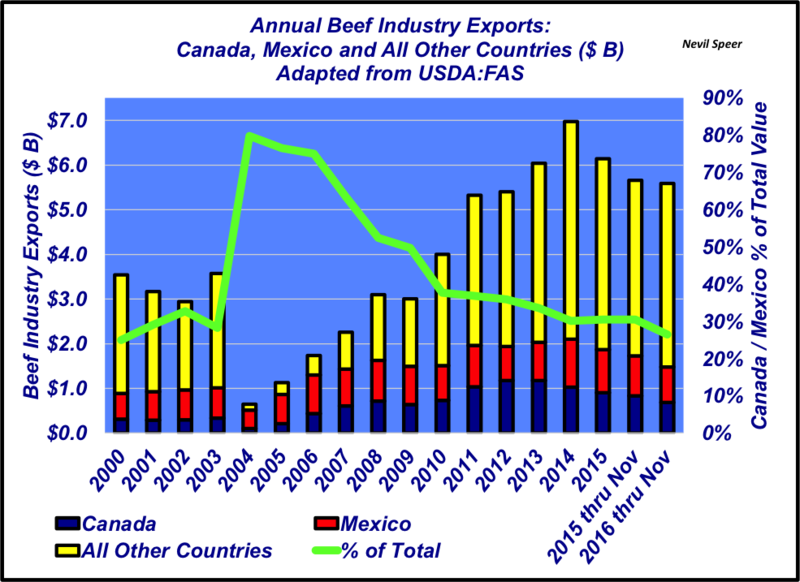 However, you slice it, beef exports represent roughly $300 per head for every fed steer and heifer marketed in the U.S.
More pertinent to this discussion is the relative contribution of Canada and Mexico. NAFTA exports, as a percentage of total exports, peaked in 2004 following BSE in the United States. However, since that time, the beef industry has been successful regaining access to, and successfully developing, foreign markets except China. As such, relative value of U.S. beef going to Canada and Mexico has declined over time. While still sizeable, Canadian and Mexican exports currently account for just over 25% of all export value. Meanwhile, though, there’s also the influence of additional pork and poultry supplies to consider if trade flow begins to be impeded by political wrangling. But that’s another discussion for another day. With that in mind, how do you perceive trade policy shaping up in the years to come under the Trump administration? What impacts might that have on the beef industry? Will this current trade uncertainty serve to halt any potential expansion in 2017? Leave your thoughts in the comments section below.